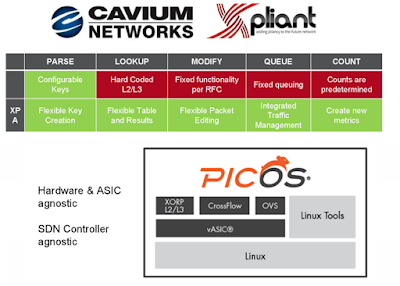 Pica8’s OpenFlow-based PicOS network operating system (NOS) will support Cavium’s new XPliant switch chip. Cavium’s programmable XPliant switching silicon, which is expected to enter commercial release in Q1 2016, is designed for providing full programmability of SDN environments. The companies said the Cavium XPliant switch, combined with Pica8's OpenFlow-based PicOS, will give network operators greater granular control to program their infrastructure. Cavium is demonstrating OpenFlow and OpenFlow-Hybrid Ethernet switches based on its new XPliant silicon. Cavium's XPliant Ethernet switches deliver full line rate support in OpenFlow through XPliant's SDK APIs and integration of Open vSwitch (OVS) at an aggregate switching capacity of 3.2 terabits per second. "Historically, large scale data center customers were only interested in the speeds and feeds of networking silicon. Now customers are looking for standards based vendor interoperable features that enable them to effectively control their networks, scale and grow over time," said Eric Hayes, VP/GM, Switch Platform Group at Cavium. "The XPA architecture is the ideal solution available today with all of these capabilities simultaneously in a cost effective manner." 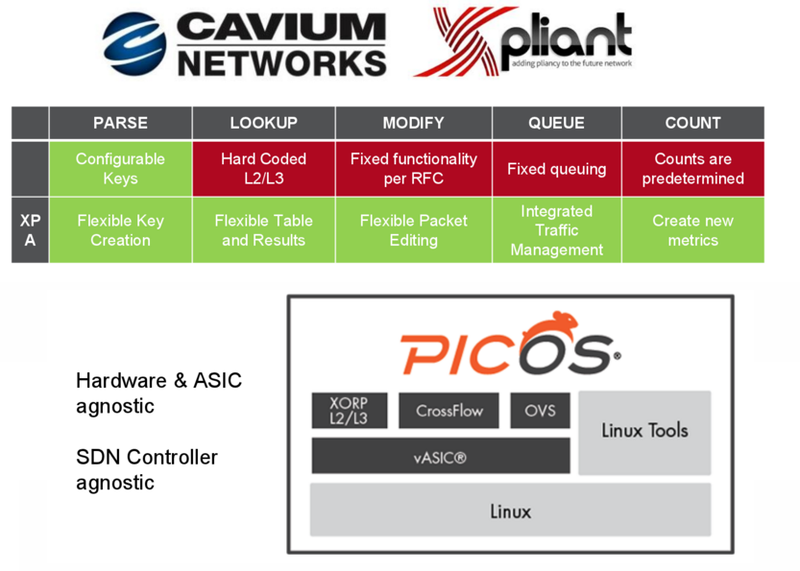 Cavium noted its XPliant packet architecture XPA Software APIs expose the OVS control abstractions, enabling users to benefit from OVS rich management and networking features, such as L2 pipeline (VLANs, LAGs, FDB, STP etc. ), bonding modes (LACP), and advanced tunneling protocols (Geneve, VxLAN, NVGRE) as well as future yet-to-be-defined standards. Now, through XPA Software and APIs, these open and industry proven features can be seamlessly invoked representing a truly hybrid switch optimized for virtualized environments, in a single hardware.